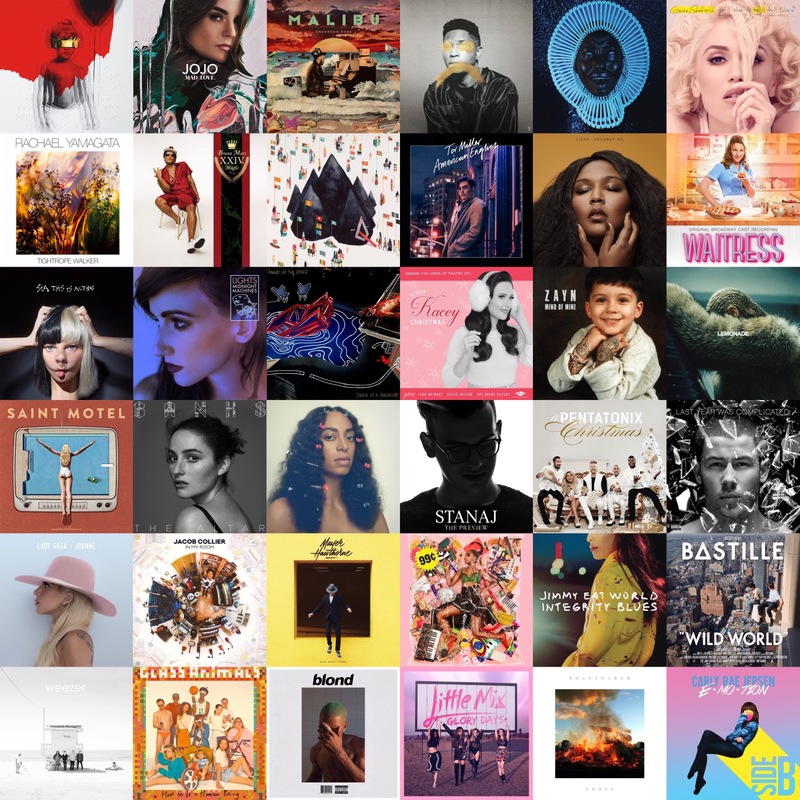 End of the year music lists are always so exciting to me, but I also always have this looming feeling of not including all the music that I did not know about, so please share your favorites with me as well! Here are 36 of my favorite major label releases of 2016. Stay musically woke, and just woke in general, my friends. If you want a playlist of highlights from these album, click HERE! Album of the year is a bold statement, but ANTI defintiely is in the running IMO. Mad Love is honestly R&B/pop perfection. Stay woke, listen to JoJo. Anderson .Paak is the embodiment of talent. If you like urban/contemporary/jazz/R&B/etc., this guy will rock your world. My all time favorite singer/songwriter serves songs from the heart, always. Some people were born ready to perform and entertain people, and Bruno is one of them. If you don’t like this record, you should reevaluate your music listening habits. Sameer is here with a voice of butter and YTG never disappoints the alt crowd. Sia is a kween of pop. Legendary songwriting and powerhouse vocals. Lights is forever underrated. With every release, she proves her mastery of pop composition and performance. I will admit that I am a late addition to the P!ATD fan club. DOAB may be the year’s best male pop/rock vocal performance. 11. Childish Gambino – Awaken, My Love! I don’t even know where to start with this guy. Donald Gover literally does it all and does it all impeccably. One of my first idols came back with an album that is solid from top to bottom. Whatever Gwen does, she does it with style, class, and authenticity. Discovering Tor this year felt like finding that gem in a vintage store. Although youthful, his old soul seeps through each track. Sass kween of 2016? Hell yeah. The amount of times I’ve listened to this OBC may be concerning. Sara Bareilles is a genius, and this cast portrayed her score perfectly. Not only did Kacey make the classics her own with her quirky country old time-y charm, her original Christmas songs may as well be considered classics now as well. Zayn’s first solo release post-One Direction is an A+ execution of the R&B/pop/dance genre lead by Bieber and The Weeknd. Feel good AOTY? I’d say so. If you need to dance, turn this up! I firmly believe some people are born cool. The Knowles family just knows. Solange has outdone herself in this neo-soul treasure of an LP. Yes Gaga, YAS. This woman is a force. Her Americana/rock n’ roll infused record is unstoppable and just screams women empowerment. I’ve followed Jacob since his YouTube days. He’s the jazz prodigy we all needed. Hello, is this the smooth operator? Put this on if you want something groovy. Let’s go back, back to yet another perfectly Weezer record. Love this band and their music as much as their aesthetic. That’s saying a lot. The LONG AWAITED come back of Frank did not disappoint. It’s a lot more “artsy” than Channel Orange, but still some great melodic structures here. If you don’t know Stanaj, you are SLEEPING! The agility and smoothness of his vocal style could slay anyone. Swear. Another xmas album on my list you say? Duh. I’m one of those “Christmas music in September people.” PTX is as flawless as ever. Nicky Jaaay. TBH this guy is still so underrated. Bacon may have some of my favorite lyrical zingers this year. Santigold is always killin’ the game with her effortlessly unique and edgy style. Hearing Jimmy Eat World play this record live (along with their oldies) for the first time was honeslty a highlight of the year. They still got it y’all! Do people even know this record happened? TBH my favorite release from the guys to date. Yas hunnies, you bettah werq. Female vocalists in alt bands always slay me. This record is a just another example of Phantogram’s quality production and performance. TFW all your B-sides tracks are fire enough to have been on the initial release. Listen to Store and tell me it’s not the catchiest chorus ever. ← [ALBUM REVIEW] JoJo – Mad Love.